The minimalist Juno space-saving wood effect hacienda black wall hung vanity unit with short projection toilet is ideal for adding a modern designer touch to any bathroom. 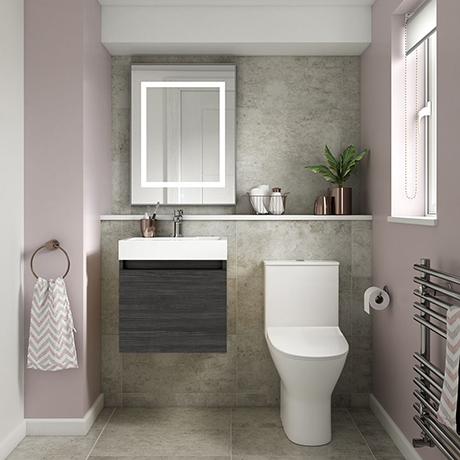 Vanity unit features a spacious highly practical soft closing cupboard door and a offset design poly-marble basin which provides a ledge for your bathroom toiletries. The stylish close coupled toilet features a stylish European influenced design, it's space saving round pan only projects 610mm from the wall making this durable toilet ideal for smaller bathrooms, en-suites and cloakrooms.